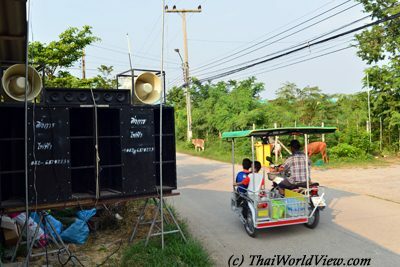 Big loudspeakers are diffusing Indian music or local Thai music. 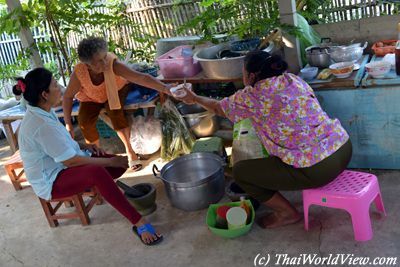 Like any Buddhist rituals, local people help each other to prepare the food. 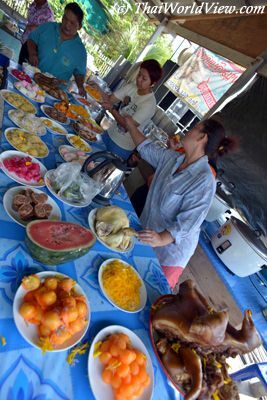 The food is paid by one or several sponsors (เจ้าภาพ). 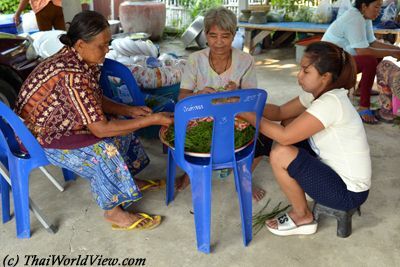 Preparing food is done by women and the atmosphere is very cheerful. 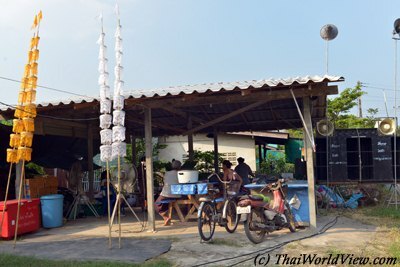 The food is prepared outside under an outdoor roof covered kitchen. 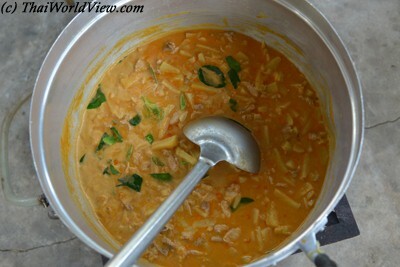 Delicious Thai dishes are under preparation. 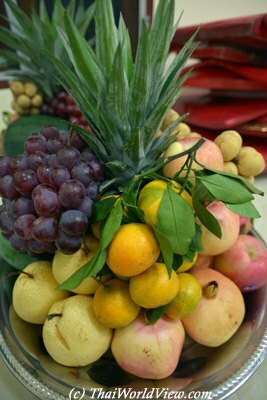 Food will be offered for free to the various participants to Spirit Medium rituals. 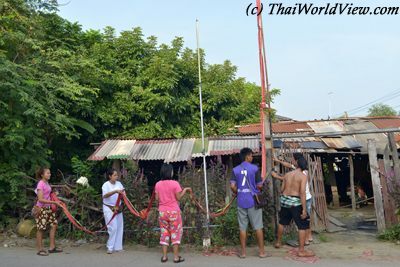 Thanks to the noisy loudspeakers, nobody in the village can ignore the coming Spirit Medium ritual. 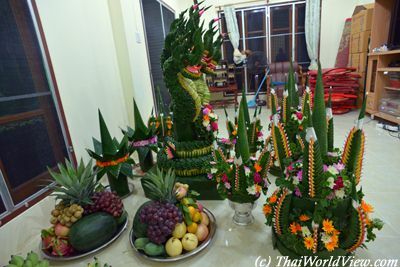 The first day is mainly the preparation of food and various sacred items. The first day is almost over. 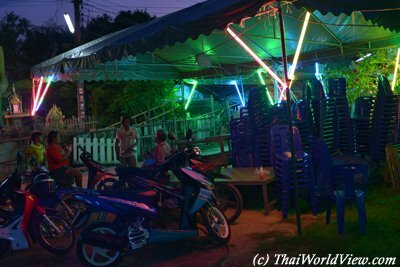 At evening time, people are gathering and chatting. Such kind of events is always an opportunity for local community gathering. 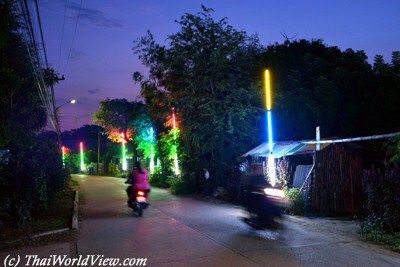 Some fluorescent neons in the village indicate the way to the Spirit Medium ritual. Inside the Spirit Medium house, an impressive altar with statues, garlands, big candles can be seen. The altar is located in a special room separated from the other rooms. 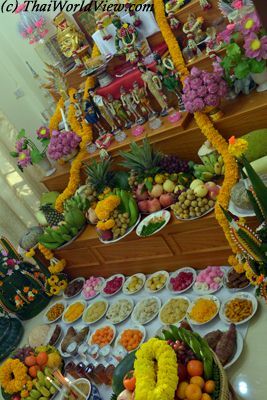 This altar is called หิ้งบูชา ("HING BUCHA" - worship shelf) or โต๊ะครู ("TO KRU" - table for the teacher spirit). 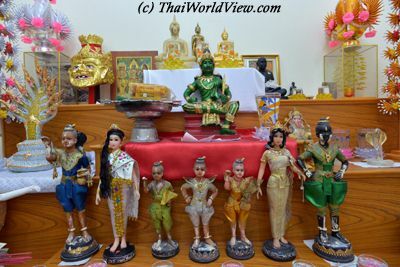 These elaborate shelves feature many deities including the Buddha statue at the top shelf. Images or statues of famous monks are arranged and placed on the second level from the top, one shelf below the image of Buddha. Indian deities should be one level below the Budddha image and Buddhist monks. Chinese deities such as Guanyin should even be one shelf lower. Royal spirits such as former kings or local guardian and other spirits (เจ้าพ่อ, เจ้าแม่) are at the same level as Chinese deities. Flowers are located on the floor. 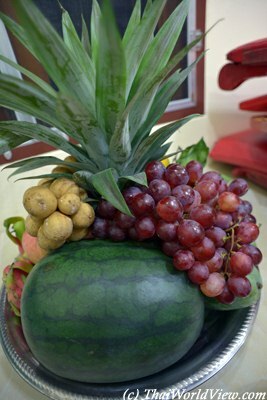 Fruits offerings include Banana, Coconut, Grape, Pear, Mango, Pineapple, Orange, Apple, Grenade, Dragon fruit, Watermelon, Longkong. 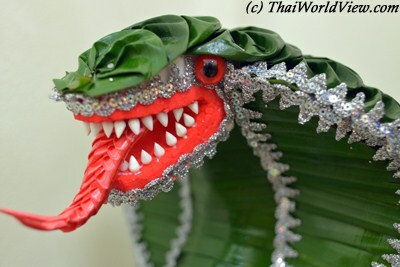 A Phayanak statue (พยานาค) made of banana leaves. It is a mystical snake. This ritual is paying homage to teachers' spirits. 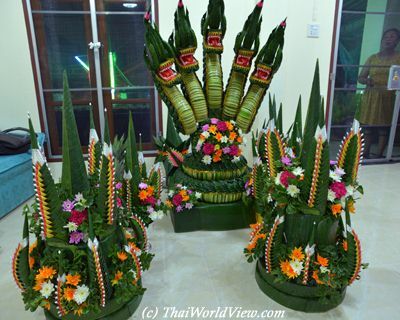 There is complex arrangement of flowers and "BAI SRI" trays (บ่ายศรี). There are umbrellas that remind the complex Brahmanistic rituals used for Royal events. 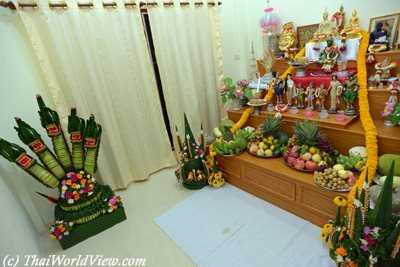 The Phayanak statue is installed in the altar room during the night. 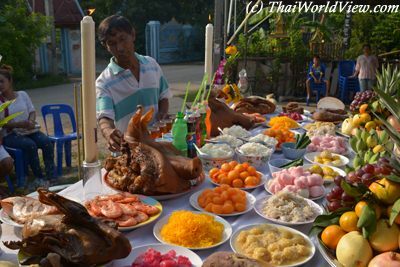 On the second day, a gorgeous food buffet is installed outside in front of a small altar. 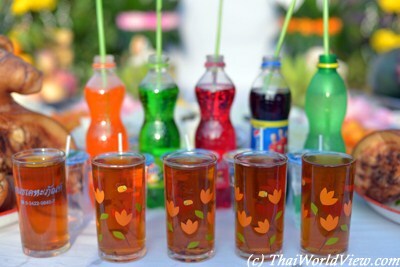 Glasses filled with tea and soft drink bottled are part of the offerings to the spirits. 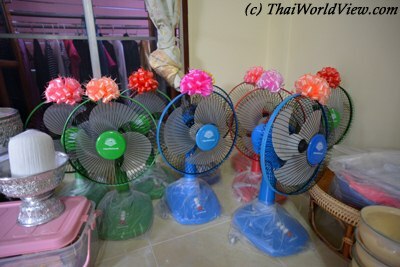 Fans are stored in the house and ready to be offered to the monks after the traditional morning prayers. 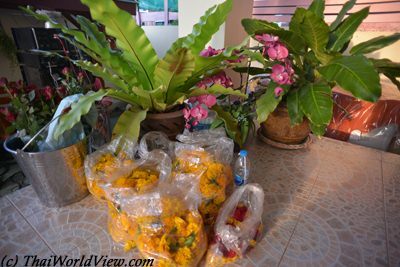 Huge flowers garlands offerings are also performed during this ritual. 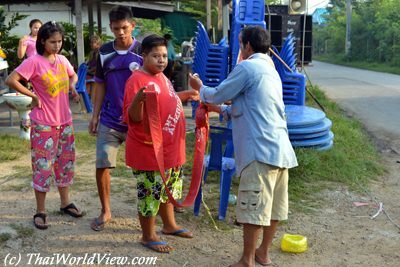 Some villagers are working on the firecrackers preparation. Big noise expected! 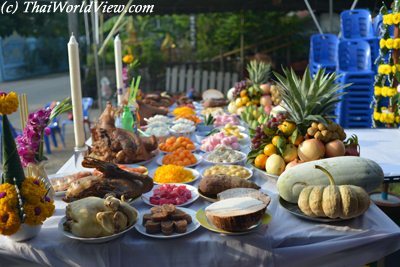 Food is also offered in front of the main altar inside the house. 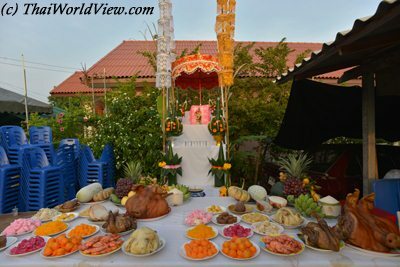 Then the offerings are moved outdoor and placed in front of the smaller altar. On top of the huge Phayanak statue, there are also two smaller Naga statues (วาสุกรี). 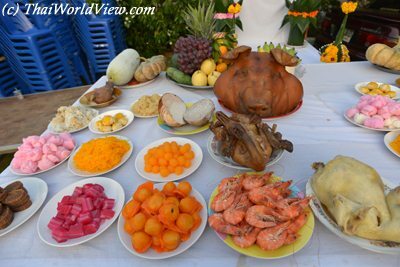 Impressive food buffet offered to the spirits and teachers! A ritual is happening during earlier morning and featuring a few spirit mediums only. Spirit possession does happen in this morning session. 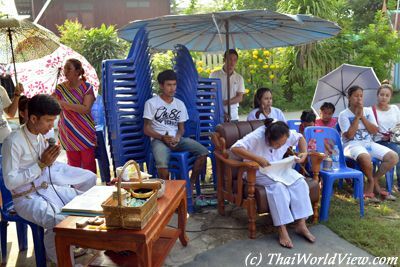 Main teacher is worshipped (งานไหว้ครูปู่). Each time a spirit medium is possessed then one of them is using a conch shell to do a loud signal. Incense sticks are then inserted inside the food items and lit. 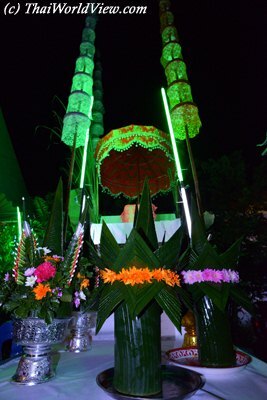 It is a way to share with the spirits and pay respect to the teachers. 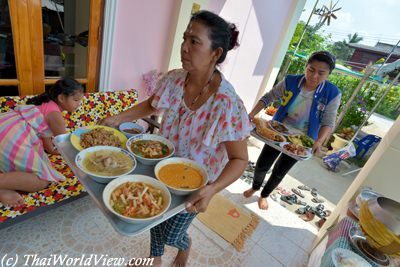 Once the ritual is over, the food is brought from the altar to the kitchen. It is then shared and eaten by the followers and participants. Nine monks arrive in the morning to pray in the medium spirit's house. 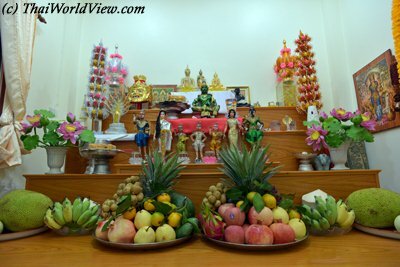 Such event really shows the syncretism of Buddhism and Animism in Thailand. Such animism belief is severely fought by some Buddhist monks. Buddhist monks are starting their prayers. On the altar near the monk, a head / mask of the teacher can be seen. 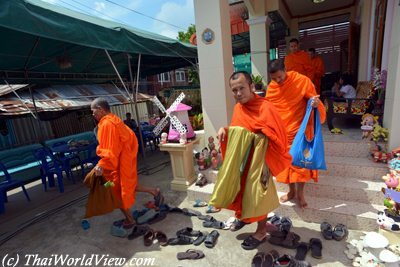 One of the monk is preparing holy water. 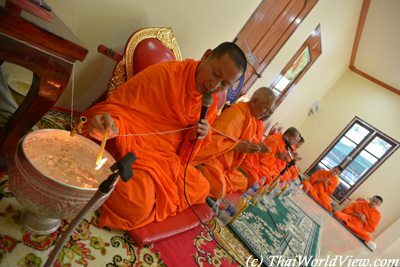 A sacred thread is linked to the altar and hold by each of the monk. 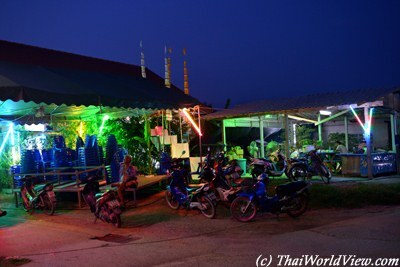 Once the prayers are over, food is brought for the Buddhist monks. Time for meal but a last prayer is done by Buddhist monks before starting to eat. 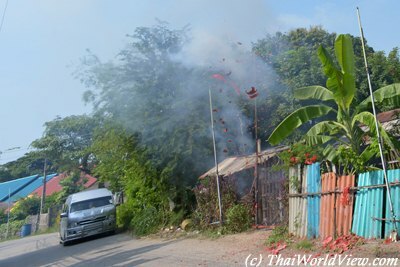 The nine Buddhist monks are now leaving. They get envelopes with money inside and a small fan as appreciation gifts.